Yesterday as I was doing some social media scrolling I came upon a paid Facebook advertisement that caught my eye. 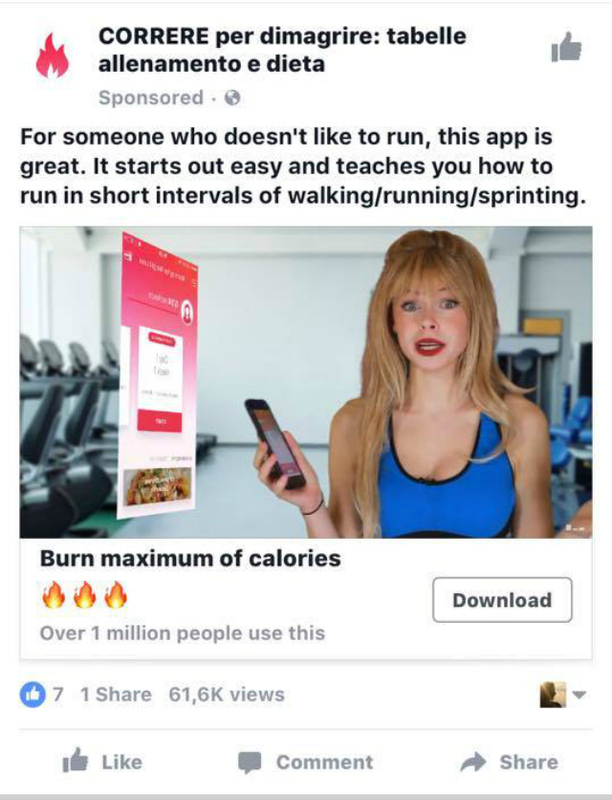 It was a targeted advertisement about a running app. I was only able to snap a screenshot but I wish you could have seen it. It featured two semi-deranged looking, well endowed young women in front of a green screen with a row of treadmills projected onto the backdrop. If you don’t like running, don’t run. Movement for me is about connecting with myself and feeling joy. I love riding my bike because it brings me to places near my house that remind me of the sights and sounds of my childhood in California. Open water swimming is the same; I spent so many teen days hitching a ride to the coast just to spend time in the freezing Pacific Ocean. The minute I smell that salty air I am ready to dive in and experience exhilaration. Running is a mishmash of emotions that span from happiness to frustration and back to an endorphin high (hopefully!) If I’m lucky I get all three in a forty minute time span, but I’ll take all or one any day. When someone comes to me to start a running programme I ask that they follow it for at least eight weeks (twenty-four workouts). In two months time they’ll be able to complete 5k and then decide if they truly like running or not. Some begin a lifelong romance, others never click with the running groove and that is fine. There are so many fun and wonderful sports and movement programs to discover, why should anyone insist on doing something they don’t like? Are you worried about burning maximum calories (insert flame!)? Any sport or movement will do that for you if you’re enjoying yourself at the same time. The important thing is that you go out and find your thing, whether it’s kicking boxing, hiking, tap dancing or Crossfit. It’s all good as long as you’re moving and you love it. You can sign up anytime for our 5K course. If you decide you don’t like running we promise we won’t make you continue on to our 10K course!